The new three-story, 65,000 square foot building is the first higher education building in the state of Minnesota to be LEED Gold certified by the U.S. Green Building Council. The design allows plenty of natural daylighting to penetrate the interior spaces, thereby reducing energy consumption. Other energy-savers such as extra insulation and efficient plumbing, windows, and HVAC systems were also incorporated into the design. 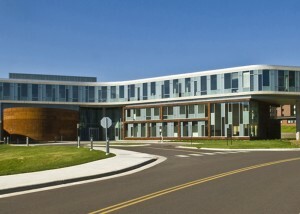 The building is organized around a three-story common area, surrounded by an administrative block, a 150-foot steel framed auditorium, and a classroom wing. The primary structural system is wide-module cast-in-place concrete, an ideal choice for the building’s unique geometry, which includes multiple curves. Post-tensioned concrete was used above the classroom wing on the third floor, which spans 60 feet across Kirby Drive, creating a new gateway to the campus.